Sidney, BC, Canada things to do, adventures, activities and attractions include tours, guides, outfitters, entertainment, events, as well as, activities like ocean kayaking, golfing, fishing, and more. Plan your next adventure and then book your Sidney BC Canada things to do, attraction, tour or guide on Canada's booking, planning and interactive website. Sidney BC Canada Things To Do & Attractions! Best Sidney BC attraction pricing often comes with dealing directly with Sidney, BC adventure businesses. ehCanadaTravel.com connects you directly with Sidney BC Canada attractions, tours and guides, no middle man. Our FAIR PRICE GUARANTEE frees up more of your hard earned loonies and toonies (Canadian currency) so you can stay an extra day or two in Sidney visiting with more attractions, dining out with more restaurants and shopping with more community businesses. If you require some assistance for planning your Sidney BC attraction we have a live Tourism Ambassador online to assist you in booking and planning your Sidney BC adventure. When you do require assistance click the Chat Button on our website or click here for travel assistance. 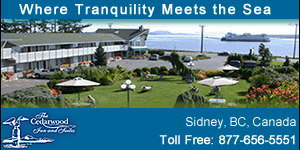 Book Your Sidney BC Canada Things To Do!